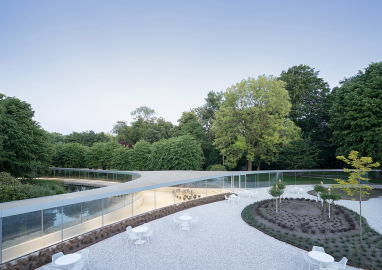 The new visitor center for Park Vijversburg is formed by three simple lines that mimic the surrounding historical landscape. There are no columns, just transparent glass facades allowing visitors to have unobstructed views towards the nature environment. 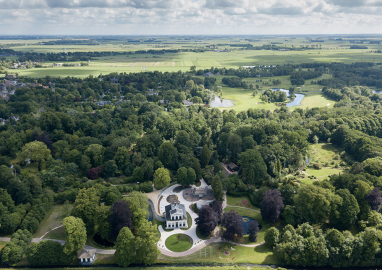 Park Vijversburg is an 18th century estate that opened to the public in 1892. The park hosts many events such as international art exhibitions, musical performances and excursions. To accommodate the increasing number of visitors, the client asked for an extension of the historical villa to be used as a meeting and exhibition space. 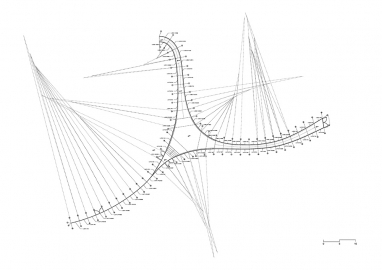 Although the pavilion is an architectural project, it was designed and imagined as a landscape. 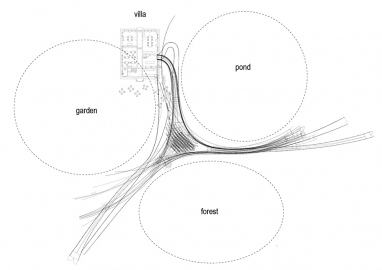 The design consists of three lines that stretch into the park and follow the existing natural elements: a pond, a tree line and the villa garden. 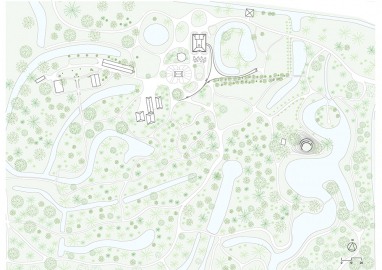 These three elevations reflect the natural surroundings and make the pavilion and landscape blend into one another. 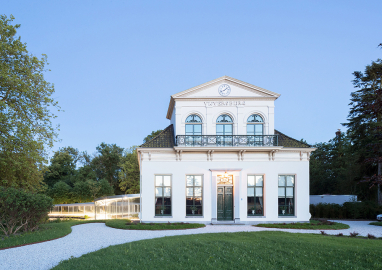 Next to the pavilion we renovated the monumental villa, designed the surrounding landscape, a park building and an open air podium. The client desired the new building to be attached to the old villa to facilitate combined programming and efficient staffing. At the same time they asked for a transparent building that would not compete with the main villa’s monumental architecture. 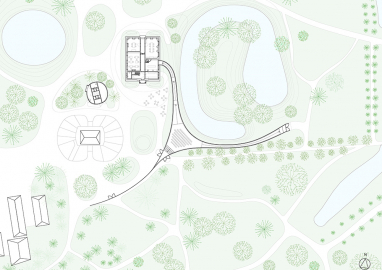 The chosen site for the new visitor center is situated in between three historical landscape elements: a 19th century pond, a 17th century tree line, and a renovated villa garden. Instead of making a solitary standing building, we propose three simple lines that each follows one of these landscape elements. 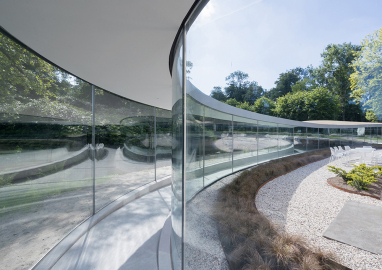 These three glass facades reflect the natural surroundings and make the pavilion and landscape blend into one another. 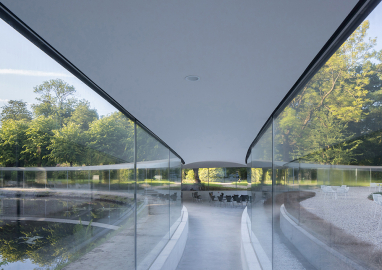 Between these three lines the interior space of the pavilion is formed, making the building an intimate part of the historical landscape itself. At the heart of the building the auditorium is sunken one meter into the ground, to reduce the building’s impact, create intimacy in the interior, but also provide another perspective on the surrounding landscape. In order to create a truly transparent architecture with unobstructed views towards the natural surroundings, the use of additional structural elements, such as columns and walls, were avoided. Instead the insulated glass walls themselves carry the roof. The glass panels consist of insulated panels with a laminated inner glass pane that carries the roof. To avoid a “green fish-bowl look” ultra clear glass was used. 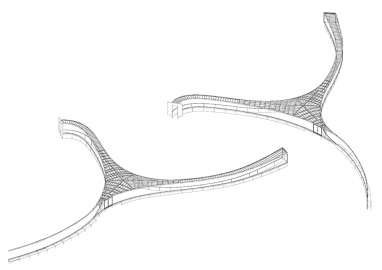 The triangular shape helps to avoid using transverse walls while maintaining a free span of fifteen meter. The other materials that were used were kept very simple and elegant too. The floor and walls consist of polished concrete with simple and clean detailing. The main structure of the roof consists of steel beams, covered on the ceiling-side with acoustical plaster. The roofing is made of epoxy bound gravel, similar of color and structure as the paths in the park. In order to maintain a comfortable building climate while use a low-E floor heating system, the roof was designed with an air plenum. It allows (hot) air to leave the building through the roof 24/7, mostly on warmer summer days.